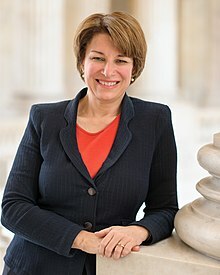 Amy Jean Klobuchar (born May 25, 1960) is an American politician and lawyer. She is the senior United States Senator from Minnesota since 2007. She is a member of the Democratic Party. She is the first elected female senator from Minnesota and the second female senator in the state after Muriel Humphrey Brown. She was a lawyer in Minneapolis until being elected county attorney for Hennepin County in 1998, making her responsible for all criminal prosecution in Minnesota's most populous county. Klobuchar was first elected to the Senate in 2006, becoming Minnesota's first elected female United States Senator, and was reelected in 2012 and 2018. In 2009 and 2010, she was called a "rising star" in the Democratic Party. Many believe that she will run for President of the United States in 2020. Klobuchar was born in Plymouth, Minnesota. She is the daughter of Rose Katherine (née Heuberger) and James John "Jim" Klobuchar, a columnist for the Star Tribune. Klobuchar was a valedictorian at Wayzata High School. She received her B.A. degree in political science in 1982 from Yale University. During her time at Yale, Klobuchar spent time as an intern for Senator Walter Mondale. Klobuchar went to the University of Chicago. Klobuchar was elected Hennepin County attorney in 1998, and reelected in 2002. In 2001 Minnesota Lawyer named her "Attorney of the Year". Klobuchar was President of the Minnesota County Attorneys Association from November 2002 to November 2003. In early 2005, Senator Mark Dayton announced that he would not seek re-election to the U.S. Senate. She was seen as a favorite for the DFL nomination for the 2006 election. In the general election, Klobuchar faced Republican candidate Mark Kennedy. On March 30, 2008, Klobuchar announced her endorsement of Senator Barack Obama in the Democratic presidential primary, promising her unpledged superdelegate vote for him. Klobuchar faced State Representative Kurt Bills and won a second term in the U.S. Senate in 2012. In late 2016, Klobuchar was known to have passed more legislation than any other senator. In February 2017, she called for an independent, bipartisan commission like the 9/11 Commission to investigate ties between Russia and U.S. President Donald Trump and his administration. She maintained high approval ratings throughout 2017, with the Star Tribune's Minnesota Poll announcing in April 2017 that her approval rating was 72%. In October 2017, Morning Consult listed Klobuchar in the Top 10 of their list of senators with the highest approval rating. In 2017, Klobuchar and Bernie Sanders represented the Democratic Party in a televised debate on healthcare policy and the possible repeal of the Affordable Healthcare Act on CNN. On February 6, 2019, Klobuchar announced on her Twitter that she will announce her candidacy for President of the United States on February 10 in Minneapolis. On February 10, 2019, Klobuchar announced that she is running for President in the 2020 United States presidential election. Klobuchar's allegedly harsh treatment of her Senate staff received some coverage before her announcement. In 1993, Klobuchar married John Bessler. They have a daughter. She is a member of the United Church of Christ. ↑ "Amy Klobuchar is being talked up as a 2020 contender who could 'bury' Trump after she won re-election in Minnesota". Business Insider. November 7, 2018. Archived from the original on November 9, 2018. Retrieved November 9, 2018. ↑ Tsukayama, Hayley (March 15, 2010). "Huffington Post names Klobuchar the smartest U.S. Senator". Archived from the original on September 10, 2017. Retrieved May 14, 2017. ↑ Dizikes, Cynthia (May 20, 2009). "As state's only senator, Klobuchar gains sympathetic attention". MinnPost. Archived from the original on September 10, 2017. Retrieved May 14, 2017. ↑ Nelson, Tim. "Rose Klobuchar, mother of Sen. Amy Klobuchar, dies". Archived from the original on February 23, 2017. Retrieved February 22, 2017. ↑ "Born to ride: Jim Klobuchar and the birth of the Minnesota bike tour". Star Tribune. Archived from the original on February 23, 2017. Retrieved February 22, 2017. ↑ "WHS Involvement / WHS Distinguished Alumni". www.wayzata.k12.mn.us. Archived from the original on March 17, 2017. Retrieved March 16, 2017. ↑ "About Amy". Amy Klobuchar for U.S. Senate. Archived from the original on April 25, 2017. Retrieved March 16, 2017. ↑ 1982 Yale Banner, p. 394. ↑ 9.0 9.1 DePaulo, Lisa (March 30, 2010). "The Audacity of Minnesota: Meet Senator Amy Klobuchar". ELLE. Archived from the original on May 3, 2017. Retrieved May 14, 2017. ↑ "The Rachel Maddow Show, Transcript 09/01/15". MSNBC. September 1, 2015. Archived from the original on January 15, 2018. Retrieved May 14, 2017. ↑ Staff, Writer (December 31, 2001). "Minnesota Lawyer recognizes 10 as 'Attorneys of the Year'". Minnesota Lawyer. Archived from the original on March 22, 2017. Retrieved March 21, 2017. ↑ Herzig, Frolik & Winnie Frolik & Billy; Herzig, Winnie Frolik & Billy (May 11, 2017). 51 Women Senators? : Will We Ever Have 51 Women Senators? When? How Will They Represent Us?. iUniverse. ISBN 9781440193033. ↑ Buoen, Roger. "Klobuchar to endorse Obama". MinnPost.com. Archived from the original on April 18, 2008. Retrieved March 31, 2008. ↑ "WHICH SENATORS HAVE PASSED THE MOST LAWS?". Northwestern University. Retrieved November 28, 2017. ↑ "Minnesota Poll results: What Minnesotans think of their senators". Star Tribune. Archived from the original on December 1, 2017. Retrieved November 28, 2017. ↑ "America's Most and Least Popular Senators". Morning Consult. Archived from the original on November 29, 2017. Retrieved November 28, 2017. ↑ Stassen-Berger, Rachel. "Amy Klobuchar, Bernie Sanders will debate GOPers over health care on CNN". Twin Cities Pioneer Press. Archived from the original on December 1, 2017. Retrieved November 21, 2017. ↑ Amy Klobuchar [amyklobuchar] (February 5, 2019). "I'm making a big announcement on Sunday. Join me there: amyklobuchar.com" (Tweet). Retrieved February 5, 2019. ↑ Smith, Mitch; Lerer, Lisa (10 February 2019). "Amy Klobuchar enters 2020 Presidential race". The New York Times. Retrieved 10 February 2019. ↑ "Barack Obama, candidate for President, is 'UCC'". United Church of Christ. Archived from the original on November 30, 2018. Retrieved October 17, 2018. Wikimedia Commons has media related to Amy Klobuchar. This page was last changed on 22 April 2019, at 14:08.